How Do I Connect Using RDP? You know that moment, when you are at work or in a social setting and someone uses an acronym you’re not sure of? ... “Yea, we do too”! Instead of just smiling and nodding, brush up on your acronyms! Equation Technologies is here to help you through this technology based, acronym centric world. 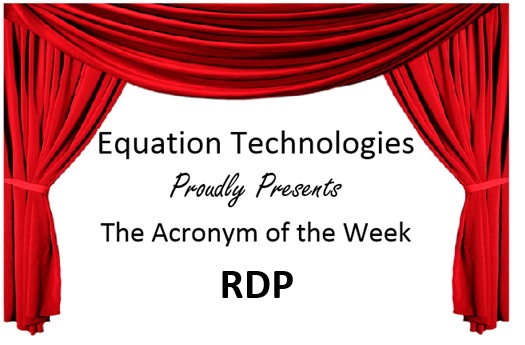 The Acronym of the Week is RDP, this stands for Remote Desktop Protocol. RDP is a proprietary protocol developed by Microsoft, which provides a user with a graphical interface to connect to another computer over a network connection. The user employs RDP client software for this purpose, while the other computer must run RDP server software. Now get out there and use RDP in a sentence!